Presenting the Common Application “prompts” or questions they might answer and helping them understand what each question focuses on. Helping them pick a question that matches their experiences and one that they feel best represents them. Starting the process of writing drafts of the essay. Giving positive reinforcement and encouragement to bring out their strengths and best efforts. Editing their essay drafts and helping students learn to write and use grammar effectively, write more concisely, and use expressive language. Monitoring their progress. Emailing you after each meeting to update you. For more information on college essay help, go to my brochure, which can be downloaded. A Belmont parent whose son is applying to nine schools, including Harvard, for the 2019–2020 school year:Jill Herer, Newton, MA parent:Caroline from Arlington, MA just finished her applications to attend college in 2018:“Debby helped me through the editing process of both early and regular applications. She was always prompt and helpful in her guiding suggestions on supplements and in giving deadlines to have drafts done by. Debby’s aid was also crucial in helping me formulate and develop my common app personal essay. I definitely recommend Debby’s services for those who feel like they need some help getting started with the writing process and/or fine tuning essays!” She is going to attend University of Michigan. Letizia Longo, Boston: “My daughter and I have had a a great experience with Debra. She has been extremely helpful in keeping my daughter on track, her suggestions were always on point and very appropriate. My daughter really liked working with her on her main essay and supplements. Thank you Debra for all your work!” Her daughter got into every college she applied to and is currently in the process of making a decision about where to go. Christy Curran, Needham, MA parent: “Debby was easy to work with and very flexible. My daughter really liked that Debby pushed her to write the best essay possible and helped make her writing come alive. Every word counts in these essays, and Debby made sure the essay was tight. She was also instrumental in brainstorming essay topics. We would highly recommend Debby and her services.” Her daughter got into Wesleyan University! Lisa Astley-Sparke, Weston, MA parent: “Debra got the whole process off the ground very quickly. She pinpointed my sons strengths and managed to collaborate in order to produce a great essay. All was complete by the time he started the admission process and it was completely stress free! She is patient, gets the ‘teenager’ and works in a very clear, timely and concise fashion using face to face contact and media. Very impressed and will use her for my other two children as they reach the end of their junior year!” Her son got into Wheaton! Liz Solar, Newton, MA parent: “From the start, Debra helped my son organize his thoughts, focus on his strengths, and write his essay early in the admissions process! Debra encouraged my son to tell his own unique story. He reflected on who he was — his personality and character — and not simply listing achievements and interests. His voice came through in a compelling and engaging way. He has been accepted to every school he applied to, and is wait-listed at one.” Her son went to Loyola University New Orleans. Other colleges and universities that Debby’s students attended include: Hamilton—Ellie just learned that she will attend in 2018!! ; Wellesley College, Northeastern University, Clark University, Lewis and Clark University, Rensselaer Polytechnic Institute. Colleges and universities accept students who can write well and use the English language effectively and their essay reflect this. 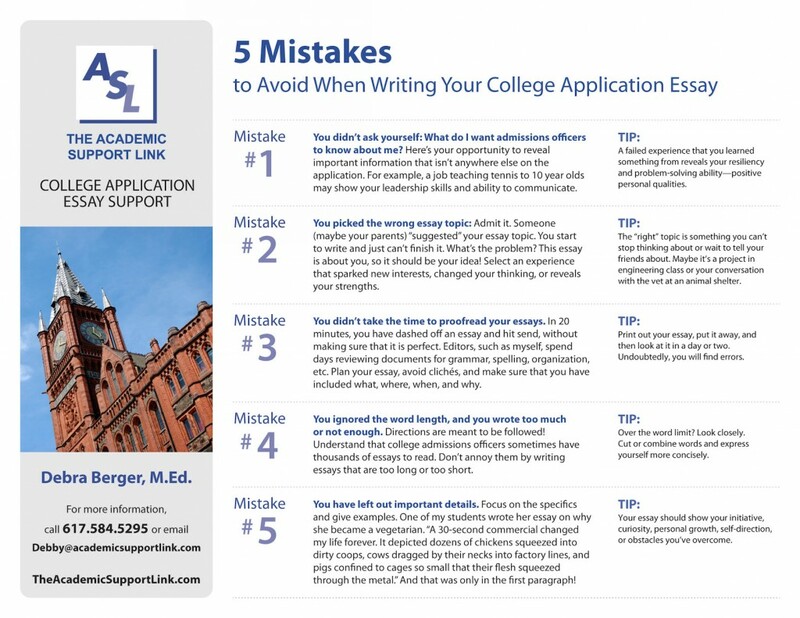 As a result, the college application essay may determine if they are accepted to the college of their choice. Please email me at Debby@academicsupportlink.com or call me at 617-584-5295 to set up a meeting and find out about costs. One highly competitive area is secondary school admissions. 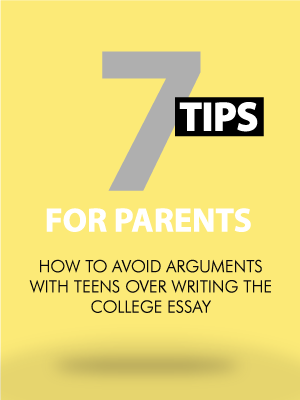 Today, students are required to write college admissions-like essays, which may present obstacles to younger applicants. I have successfully worked with these students, helping them develop their essays and guiding them gently through the process. This takes time and requires meeting with students and setting deadlines for their essay drafts. Start the process early by calling me at 617-584-5295.